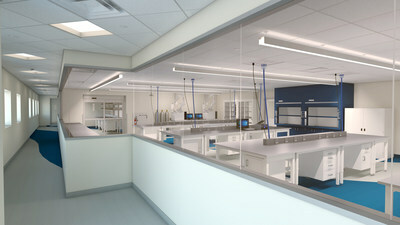 LSNE's new lab space located at 7 Commerce Drive in Bedford. ​Lyophilization Services of New England, or LSNE, a Bedford-based contract manufacturer that serves pharmaceutical, biotech and medical device clients, announced today it will expand its quality control laboratory in Bedford and provide new employment opportunities for its analytical and operations workforce. This expansion is part of LSNE’s strategic growth plan to enhance its operations and capacity to better serve its customers. LSNE’s expansion plan includes 38,000 square feet of new quality control laboratory space and newly renovated centralized warehouse, which will offer longer term product storage for clients. The laboratory and warehouse are scheduled to be validated and operational during the second quarter of 2018. Additionally, in conjunction with this expansion, LSNE will add approximately 20 new full-time positions. As construction is performed, LSNE’s current QC lab will remain fully operational to avoid any interruption to ongoing customer services.